The diet that set the stage for people in Okinawa living into their 100s, experiencing some of the healthiest longevity in recorded history, was one of either a poor agricultural society or one bearing the hardships of war. Near the end of World War II, in 1945, the US Army and Marine Corps invaded Okinawa with 185,000 troops. A third of the civilian population were killed; a quarter of the civilian population were killed during the 1945 Battle of Okinawa alone. 89-year-old Zen-ei Nakamura from Okinawa. From National Geographic. 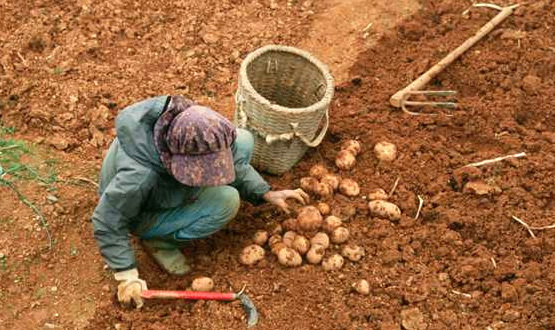 Okinawans ate a very low fat, high carbohydrate diet: 85% carbohydrate, 9% protein, 6% fat. The foods they weren’t eating? Not much fruit. Not many nuts or seeds. Not much oil – at 2% of calories, it works out to less than a teaspoon of oil a day. And hardly any animal foods. Fish, at 1% of total calories was about one 3-ounce serving a week. All other meat, including poultry, worked out to one small serving a month. One egg every two months. 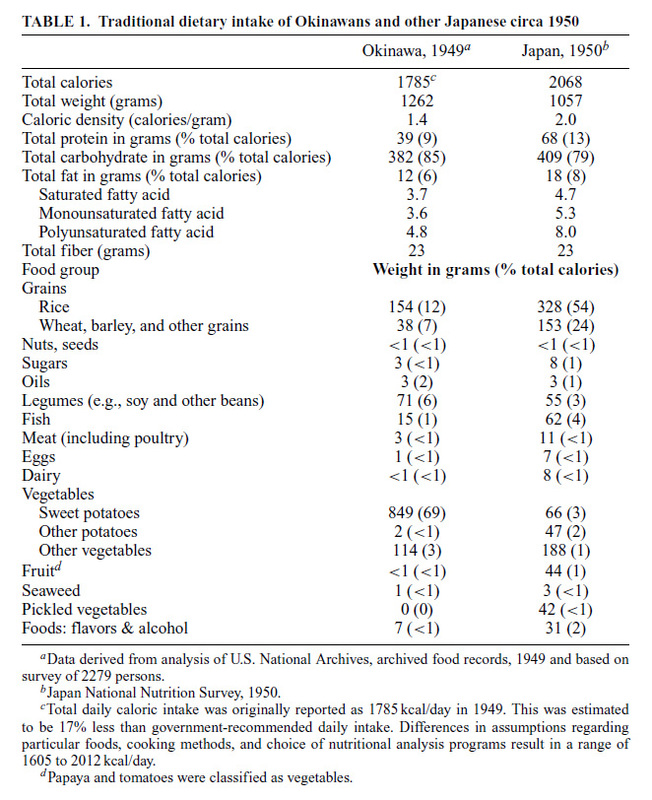 The foods they ate had a low caloric density but a high nutrient density. That kept them lean but fit. 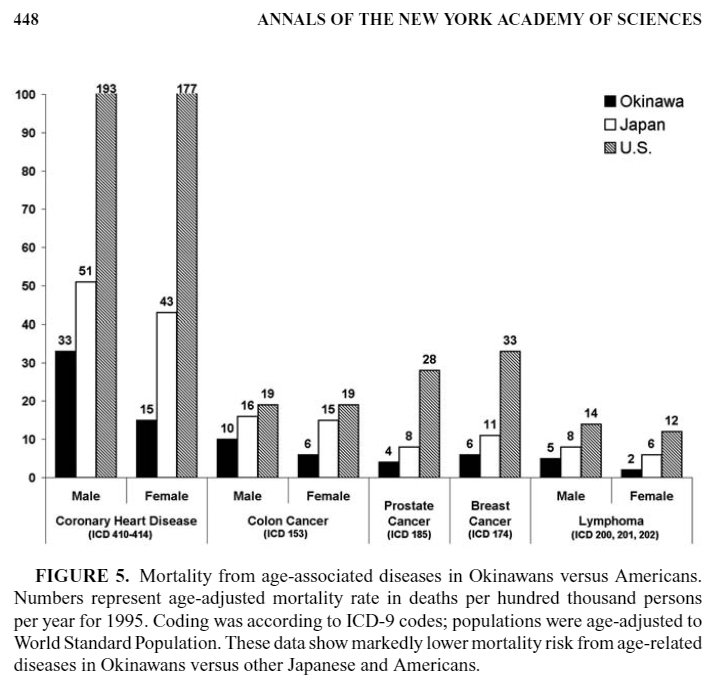 The BMI of adult Okinawans remained stable at a very lean level of approximately 21 kg/m2 until the 1960s. During the 1960s the Okinawan adult BMI began to rise. This was coincident with a shift to consistently positive energy balance. 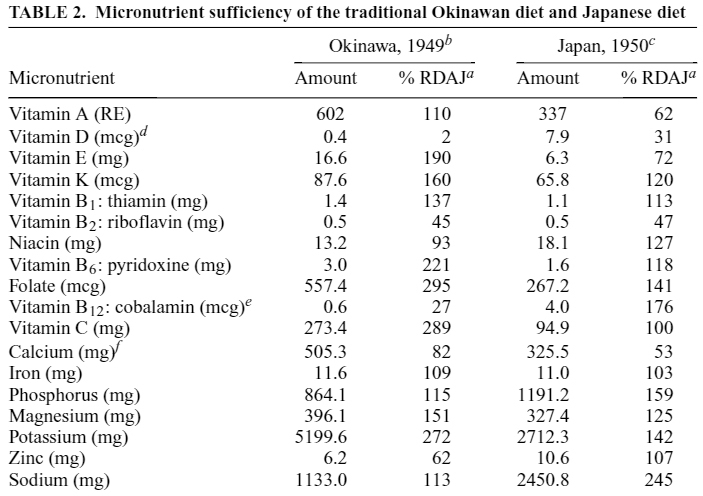 Was the Okinawans’ traditional diet a primary factor in their longevity? I think so. One thing you can say for certain, it didn’t impede long life. 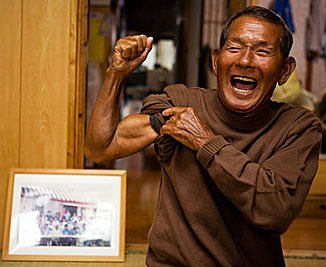 Photos of Okinawans from National Geographic. The video stated that Okinawa now has the highest rate of obesity in all of Japan. I’ve been reading that people believe the people of Okinawa eat, and ate, a lot of meat, especially fish and pork. This may be the case after the second world war, but it wasn’t the case prior to that, prior to the 1940s. And it was that early part of the 20th century when they ate the food that propelled them into very old age. When they added the meat, they began to die sooner. Interesting that at times food was scarce. So they were forced to fast. Was it the fasting that contributed to the longevity? Good point. I think it contributed. No doubt that the wars years may have impacted the diet of Okinawa but I doubt the food survey from 1949 accurately reflects their traditional food consumption. Does anyone honestly believe that an island population with an abundance of fresh seafood at their disposal would only consume it in small amounts. Also, they cooked using lard and they love their pork. I don’t buy these stories about their diet being near vegan and low-fat. At least, not their true traditional diet. If their crops were failing, what were they feeding the pigs? The idea that a poor, war-torn population was free to fish and raise livestock is a romanticized view of life in turn-of-the-century Okinawa.